The installation CENTREPIN SOUND MATRIX uses sounds to display their frequencies as fluctuating patterns formed by the movements of 49 compass needles. In case of silence, the needles turn to their resting position facing north. 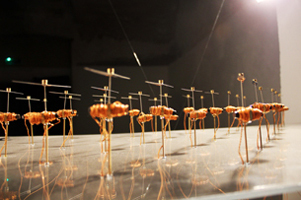 A board of magnetic needles translates audio signals into movement via electric coils. In this way, they form frequency patterns which reproduce the sound in the form of a spatial display in real-time.